who was associated with the earlier effort to restore the cemetery. The town is located between lakes Krzywe, Koscielne, and Boczne. Przerosl was established in the first half of the 16th century. The process of localization of the city was completed with the recognition of Przerosl as a city by King Stefan Batory in Torun on November 23, 1576. The city received a seal and a crest of a lion behind a grating. The citizens were freed from any land taxes and were given a number of privileges, including three fairs a year and a market every Saturday. All the profits available to the city were from taxes collected from the merchants. Thanks to the location on the crossing of various trade routes (e.g. Grodno-Krolewiec), Przerosl was the biggest city in the region. Unfortunately, the growth of the city was halted at the start of the second half of the 17th century because of the war with Sweden and a cholera epidemic in 1657. Wars and disasters in the second half of the 17th century decimated the population of Przerosl. King August III restored the rights of the city on November 14, 1748, wanting the city to grow once more. The period from the 18th century until the end of the first half of the next century can be called the "golden times" of Przerosl. In 1799, the city had 246 houses (11 were official) and 1,310 citizens; it was still the largest town in Suwalszczyzna, and it was still growing. The city continued to grow until the 19th century. After the Polish Uprising of 1863, Russian authorities, acting on Czar Alexander II's decree of June 1, 1869, terminated the civic rights of 338 cities, including Przerosl. Just before World War I, small cooperatives began to appear. There was also a local bank. After the start of World War I, marked by massive losses by the Russian army in 1914, Przerosl was occupied by Germany. After regaining its independence when German forces left Przerosl in September 1919, the local community created a city council, with a student by the name of Jozef Warkasa as its leader. After the war, the county of Przerosl became a part of the Suwalskie district in the Bialostockie Wojwodship. In the 1920's and the 1930's, little changed in Przerosl, which slowly declined in importance. The population declined  and because of this crisis, no maintenance works in the city were carried out. Przerosl existed only because of its ancient dreams of glory. September 1939 brought occupation of Przerosl by the Red Army and, on September 28, 1939, by the German army, which remained in Przerosl until October 1944. After the end of the war, Przerosl, the county seat, covered an area of 6,665 hectares. It is still part of Suwalskie district and the Bialostockie Wojwodship. Currently, the mayor is Mr. Adam Kacprzyk. From the founding of the town, Jews started to come to Przerosl, but for an unknown reason they didn't settle there, instead they moved on after a while. The first traces of Jewish settlement were after the plague of 1709-10. New Jewish settlers had a serious influence on growth of the city. In 1728 there were innkeepers named Mosze Jozefowicz, Efraim Salamonowicz, Martaj Aramowicz, and Leba Jakubowicz. In 1736, Wilenskies Bishop M. Zienkiewicz allowed the Jewish community to build a synagogue and to lay out a cemetery on Zusenkowskiej Street. In 1799, there were only 205 Jews in Przerosl. In 20 years time, there were already 443. And in 1867, they formed a large community of 598 people. This growth could not have been due only to natural growth, it must have been caused by a continuous flow of new settlers. This shows clearly the attraction of Przerosl. Jews mostly lived close to the city market, and were middle class in wealth. They were mostly craftsmen and tradesmen (e.g. clock maker Echryzel Zukowski and glazier Gotlib Ilinc). Jews owned six breweries, nine distilleries, and 16 inns. The 1820 census mentions 10 innkeepers as being among the most wealthy people in the city. The wealthiest was Nysko Abramski. During the period between the wars, Jews were tradesmen. At the end of the 19th century and during the period between the wars, many Jews emigrated to the United States, with a few people emigrating from nearly every family. It is worth mentioning that the wooden church in Przerosl was built by Jewish carpenter Abraham Peltyn. After September 24, 1939, when Russians occupied Przerosl, Jewish homes and shops were robbed by Russians. September 28, 1939, brought a change of government, as the Germans took the city from the Russians. In December of 1939, the Jews of Przerosl were moved to camps in Siedlce and Lukow, where most of them died. The rest of the Jews were transferred to Treblinka and were killed there. I didn't find anyone from Przerosl who survived those camps. The cemetery is located on the southeastern side of the town, close to the road to Zusno. 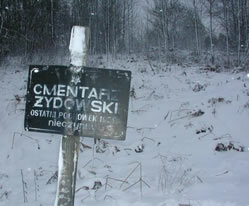 Its borders were marked by Bishop M. Zienkiewicz in 1736. It was first surrounded by a wooden fence, but in 1839 the fence was rebuilt into a stone wall. The area of the cemetery is 0.6 hectares in almost a square. There are 24 matzevot standing, most of them broken. 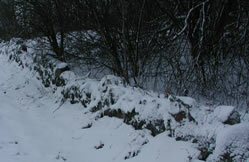 The border of the cemetery is mostly visible, thanks to the wall which is visible on all sides of the cemetery. There is a hollow running through the whole cemetery. Matzevot are hardly readable. Most of the trees in the cemetery are self-seeded. 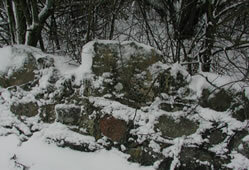 The wall is in bad condition and is seriously damaged, although it remains visible on the whole border of the cemetery. All of the damage to the wall is from age, I didn't find any traces of purposeful damaging or devastation. The last burial took place in 1939, as we are informed by a sign in the cemetery. The cemetery has been seriously neglected, but the authorities are very positive about the project. The new wall could be built on the old foundations and the remains of the old wall. All the work appears to be quite simple and should be carried out quickly. 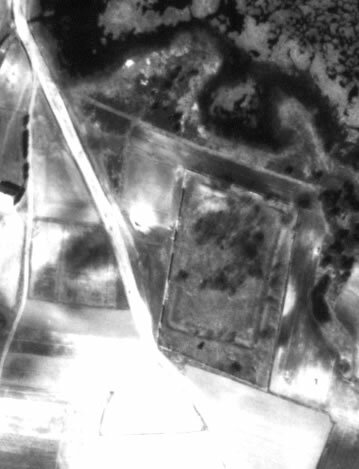 Aerial photo of Przerosl Jewish Cemetery, about 1965. Recent survey of Przerosl Jewish Cemetery.